New with tags. The full length of the trousers is: 37.50 inc Inseam measurement is: 28.50 inc Waist measurement is: 30 inc If you have more questions please do not hesitate to ask. Please view my other listings as well. Zara Womens Trousers - Large. Dispatched with Royal Mail 2nd Class. Up for sale this lovely pair of Beautiful Zara Gold Cotton Skinny Leg Trousers In Size 10. ZARA Woman. floral and leafy pattern. 97% cotton. fly zip with hook fastener above. 2 back pockets which are still sealed. 2 side pockets. narrow black waistband. Composition: 58% Viscose 39% Cotton 3% Elastane. P A Y M E N T.
100% GENUINE & AUTHENTIC ZARA ITEM. Straight, high waist trousers with front pockets, welt back pockets and darts on the knee. Zip and snap-button fastening on the front. Cotton 98% Elastane 2%. Excellent condition (like new) animal print trousers slim cigarette pants by Zara, size labelled as L UK14 EU42. inside leg: 26". I will be happy to help. Blue Cotton ZARA Slim Fit Stretch Zip Fly Women's Trousers Pants Size W31" L28"
Size EUR38 W31" L28". Blue Cotton ZARA Slim Fit Stretch Zip Fly Casual Trousers Pants. The trousers are good condition with stains. Rise - 8"( 20.3 cm). Total length - 36.5"( 92.7 cm). ZARA Z1975 Denim Collection. Khaki Greens/Browns Camouflage Print. Size UK 8 Eur 36 US/CAN 4. cotton culottes/trousers - wide leg. Cropped trousers. Front zip. Composition – 91% Cotton, 8% Polyester, 1% Elastane. Jacquared print trousers. Zip closure. 25% polyester 73% cotton 2% elastane. ZARA BASIC. BEIGE SMART WORK OFFICE TROUSERS. WAIST 30" (76cm). 100% COTTON. SHORT ZIP FLY. ACROSS BOTTOM OF LEG 10 " ( 26cm). 2 FRONT SIDE POCKETS. do my best to provide as much information as possible. Size EU 36 / UK 8-10 / S-M. Stylish and comfy trousers with an elastic waist at the back, side pockets, welt pockets at the back, Zip and button fastener at the front. This gorgeous trousers is relaxed and sophis ticated. Bell bottom polka dot trousers. Composition – 57% Cotton, 41% Polyester, 2% Elastane. Zara Trafaluc. Navy ,coral,blue bold floral print stretch trousers. Size S/ UK Size 10. Inside leg 27" approx. Ladies jeans by Zara.Medium rise, relax fit. EUR 42, USA 10, MEX 32.Hardly used. Ladies jeans by Zara.Medium rise, relax fit. EUR 42, USA 10, MEX 32. Hardly used. Very good condition. I will be on holidays from 05/03/19 to 07/05/19. All sold items will be shipped on my return. Any question please e-mail me. Brown Cotton ZARA Chinos Tapered Pleated Women's Trousers Pants Size W31" L29"
Size M W31" L29". The trousers are good condition. Total length - 39"( 99 cm). Weight - 395 g.
Zara 1975 Pink Chino Trousers. Size 38, 10, S. 75% Cotton, 25% Elastane. Machine washable at 40 degrees. 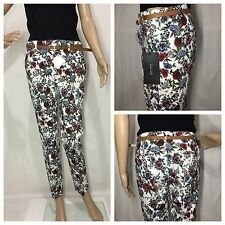 ZARA Woman Premium Slim Fit Capri Boot Trouser/Pants - Size UK 10 = Medium. Material is blue strechy cotton. Colour is like jeans look. Dispatched with Royal Mail 1st Class. Excellent condition. Worn only twice and too small for him.